With her style philosophy firmly out in the world, Nina decided to address the most popular question readers consistently ask her: Exactly what are fashion´s timeless pieces? So we picked the charm bracelet (name) from Eduardo´s Heritage Collection and giving it a meaning on the fashion industry, but also, to talk about every element of this lovely and unique piece. Charm bracelets date back to the ancient Egyptians. They used them to ward off evil spirits and show their status. But the main function of the charm brcelet for the Egyptian was to be a sort of ID tag to help the gods place each person in their proper status level on the other side and to reunite them with all of their belongings. Think of it as a boarding pass for the afterlife. 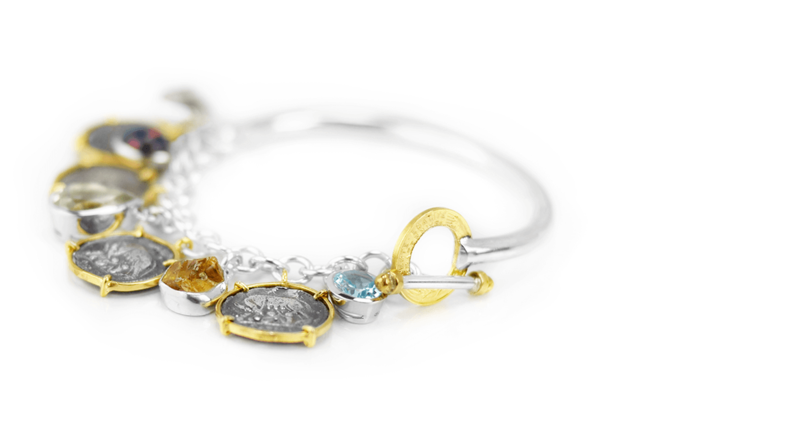 A charm bracelet is a very personal piece that you can start at any time in your life. It is a wonderful thing to start when you hit a milestone – graduating hight school, entering college, getting merried, having a child – so that it will remind you of those specific years. Consider having several charm bracelets and giving each one a theme, or have one charm bracelet and gradually build upon it. This is a great item to shop for vintage and looks much more authentic when some of the pieces are new and some are older. Don´t get too stuffy about it. Beautifully crafted bracelet with Eduardo’s vision of many elements so as 14k gold French and sterling silver Helvetic coins, moons tones, amethyst and right just in the middle a dark druzzy who gives the perfect sparkly touch. Carefully handcrafted in sterling silver with carved 14k gold French coin with a unique toggle closing system.